The England and Wales Cricket Board (ECB) will announce the identity of the new England coaching team on Saturday at a 10:30 BST Lord's news conference. 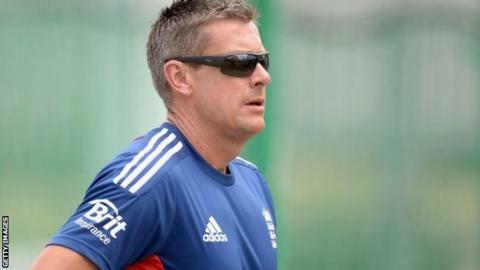 Ashley Giles, who has been England's limited-overs coach, is one of the five candidates to replace Andy Flower, who quit after the winter's Ashes debacle. Peter Moores, coach between 2007 and 2009, hopes for a second England stint. Nottinghamshire's Mick Newell, Sussex's Mark Robinson and Australian Trevor Bayliss are also in contention. England's next match is a one-day international against Scotland on 9 May. ECB chief executive David Collier told the BBC's Test Match Special earlier this month that managing director Paul Downton has scoured the world for Flower's replacement. "It's a fact there are a limited number of coaches around the world at this present time," said Collier. "You've only got to look at the media speculation of who might or might not be on lists to see there are not too many names on that. "But we're very satisfied that the top people are applying and I know Paul is being very, very diligent in going through all of that list." Giles was in charge for England's disappointing World Twenty20 campaign in Bangladesh, in which they failed to progress beyond the group stage and bowed out with a shock defeat by the Netherlands. Asked about the former England spinner's chances of being appointed, Collier said: "It's very unfair to talk about one individual candidate when there will be four or five people interviewed."